Before Excalibur dehydrator reviews begin in our journey to the best food dehydrator for you, it is reasonable to say a few words about dehydrators, in case, you don’t know what a dehydrator is. A dehydrator is a food dryer. It is also otherwise known as a food dehydrator. You use this kitchen appliance to dry your fresh fruits and produces to preserve them so you can have healthy ready made snacks free of chemicals and preservatives. If you are a jerky lover, this machine is a jerky maker too. You can use this Excalibur food dehydrator to dry non-food items like flowers for potpourri, arts and crafts stuff and even pet food. Now that you are reading this Excalibur dehydrator reviews on this great drying machine, Excalibur Dehydrator 3900B, you are one step away from possessing one of the best food dehydrators currently available on the market in this price range. Eating chemical and excessive salt- free healthy snacks like dried fruits, vegetables, jerky etc. in the company of your children and family and in the privacy of your very own home will no longer remain a dream. This very Excalibur food dehydrator, made by the famous US Excalibur company, which has been in the market with a great reputation since 1973, will make your dream come true. This food dehydrator is distinctly different from its opponents in the sense that all dehydrators do the drying job, but this specific Excalibur food dehydrator dehydrates foods in a healthier, better, and quicker way. It’s equally ideal for the beginning level users as well as professional drying. Therefore, it’s a bit expensive. A beginner not needing this much space and wanting to spend this much money for the first time may check out Presto 06300 Dehydro or Excalibur Dehydrator -2400 that are basic dryers with low price tags. Below we will see the specifications and salient features of this Excalibur food dehydrator. 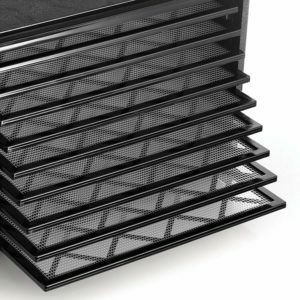 Engineered with an exclusively patented Parallex Horizontal Airflow system, this Excalibur dehydrator dries foods quicker, leaving all the necessary nutrients and making the food look and taste better. Another advanced technological feature applied to this food dehydrator is the patented Hyperwave Fluctuation Technology that stops foods from being hardened and forming yeast, bacteria, and fungi. The system does it through the fluctuation of the temperature according to the need while other cheaper models distribute heat constantly the same way and thus often make the food hardened and leave room for yeast, bacteria, or fungi to grow as they cannot dry out all the moisture from inside the food. This Excalibur Dehydrator with 9 trays offers you a total of 15 square feet of drying space making it an ideal drying machine even for a large family. Unlike stacking models in which accessibility to a particular tray is quite bothersome, at times, this particular model gives you easy access to trays and you can even make more space for drying larger food items by removing trays as needed. This Excalibur food dehydrator comes with an adjustable thermostat with a heat range from 105˚-165˚F that controls the heat level depending upon the type of food you will dry as it may vary. So obviously, you can safely dry meat for jerky with this Excalibur dehydrator. An adjustable thermostat gives you the liberty, in fact, to manipulate the temperature according to your need. Excalibur dehydrator reviews discovered that this food dehydrator doesn’t have a timer. However, it’s not a big issue with many, as any timer purchased from your neighborhood store can do the job.